The city of Bergamo is part of the Tentative list of Italy in order to qualify for inclusion in the World Heritage List. Bergamo is a kind of town that invariably leaves a positive impression on any visitor without tipping the scales on the exceptional side. I visited it in November of 2018. Città Alta, the historic core of Bergamo, is a classic, if larger than many, hilltop town. There are several eye-catching sights in its confines, largely clustering at or around the focal point of the town, Piazza Vecchia. The 17th-century Palazzo Nuovo, nowadays a public library, and the 12th-century Palazzo della Ragione, a former town hall, bookend the attractive square. Also here is Palazzo del Podestà housing a very interesting museum of the Venetian era (whose main shortcoming is that most of its interactive exhibits are in Italian only). Campanone, or La Torre Civica di Bergamo, a 12th-century exquisite bell tower with fantastic views over the entire city, is accessed through Palazzo del Podestà. The adjoining Piazza Duomo is home to an impressive ensemble of religious architecture. Basilica di Santa Maria Maggiore is easily the most jaw-dropping church around, almost obscenely opulent in its interior decorations. By contrast, the interior of the Cathedral is practically understated, prepossessingly elegant. The combination of the Santa Maria’s porch and the adjoining façade of Cappella Colleoni, all in multicolor Veronese marble, is among the most frequently reproduced visuals of Bergamo. The interior of the chapel is definitely worth a look as well. Elsewhere in town, highlights include medieval towers, such as Torre del Gombito, neoclassical palaces, such as Palazzo Medolago-Albani, the fort of Rocca, museum of the famous local son Gaetano Donizetti, and enough other minor attractions to sustain longer than a day-trip visit. Away from the main squares, though, the town looks mostly no more than nice, with just occasional details to catch the eye. Compared to other Italian WH cities, it is probably a notch below many, and it would not surprise me if it never gets a place on the inscribed list, especially since its fortifications are already separately enshrined. It would get 3 stars from me out of 5. Città Bassa, the Lower Town, is part of the tentative submission as well. 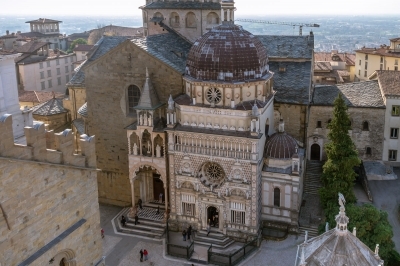 It gets a short shrift from the majority of visitors, just as it did from me, but I suspect that anyone spending a bit more time in Bergamo might find a number of impressive views and interesting details here. Bergamo is a beautiful town, with the centro burried deep inside the citta alta, concealed by layers upon layers of seemingly deserted streets. When you first enter the wall (which was not as straightforward as I thought it was going to be) you will be met by empty and quiet alleys that wind in and out of corners senselessly. But then the corner turns towards the old square, and the city reveals its beauty and streets upon streets of candy shops, butcher shops, fruit and veg sellers, etc. It's like finding a Shangri-la.